American slavery was central to shaping the country we live in today, yet most Americans know little about the institution and its impact. Worse, what people believe they know is often more mythology than history. It’s a difficult subject to broach, but critical to understanding modern America. Several recent efforts grew from a recognition of the need to understand our shared history. Retired lawyer and real-estate magnate John Cummings used millions of his own money to turn the Whitney Plantation in Louisiana into a museum for teaching a more truthful history of slavery. It opened in 2014. Years of toil created the Smithsonian’s National Museum of African American History and Culture, which opened in 2016. And this April, the Equal Justice Initiative opened the Legacy Museum in Montgomery, Alabama, to tell the story of the subjugation of African Americans from slavery to mass incarceration. Here in Seattle, attorney Jeffrey Coopersmith has spent five decades collecting thousands of items that trace American history from colonial times through Barack Obama’s presidency. The artifacts spotlight women’s suffrage, Japanese-American internment, and the anti-Chinese immigrant fervor that led to the Chinese Exclusion Act of 1882. But the great majority focus on slavery and the oppression and resistance that followed. What he’s learned has “helped explain so much about where we were and where we could go” as a country. The artifacts aren’t available for public view now but eventually will be, Coopersmith says. A report this year from the Southern Poverty Law Center found that high-school seniors understand little beyond simplified versions of the history, and many state teaching standards and textbooks fall short of fully addressing slavery and the treatment of black Americans. Only 8 percent of surveyed seniors identified slavery as the central cause of the Civil War. We should all know at least a few basics. Cotton picked by enslaved people made the United States an economic power. The country’s westward expansion, devastating to Native Americans, was partly driven by the desire for more land for plantations. America’s deadliest war, the Civil War, was fought over slavery. And, the ideology of white supremacy that grew from being a slave nation still affects people across the spectrum of human colors. Coopersmith’s collection tells the story of America through everyday items that make the history more real than words in a history book alone. He found a child’s figurine from the 1910s that depicts a Klansman standing in front of a sign that reads “Free Bath,” and beside him is a black child in a caldron of boiling water. Yes, that was just fine in America once. Sometimes people cry when they look at pieces in the collection, such as iron shackles made for a small child. The collection includes photographs, statues, books and a slave punishment collar, postcards that show a lynching, scrapbooks and flags, a silver chalice that a community of enslaved people made for their minister from melted coins they’d saved. Coopersmith has acquired the belongings of famous people and of people history has forgotten. 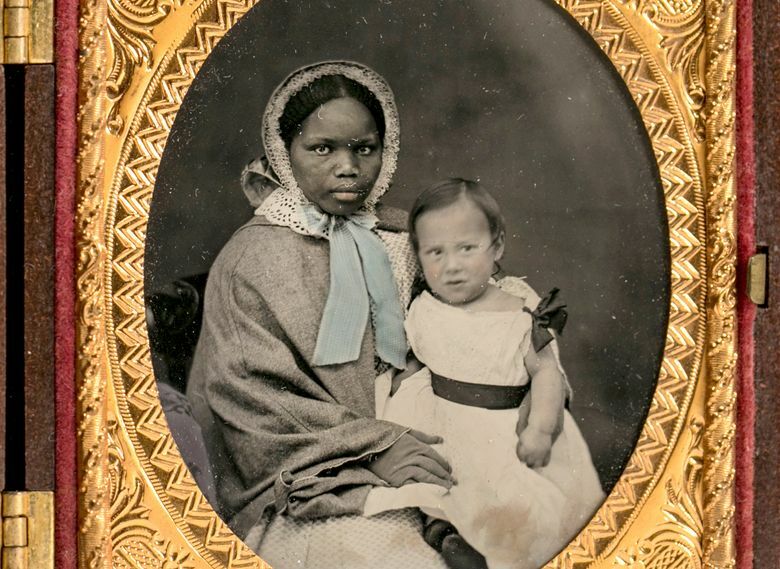 What do you see in the photograph of a nanny and child, one black and enslaved, the other white and free? What stories do their faces tell? Or two black men in uniform holding hands, brothers who’ve just volunteered to fight in the Civil War and who might never see each other again? Coopersmith’s knowledge of the history deepened over the years, and from time to time he shared the artifacts and what he knew about them with small groups of friends. That’s how I learned about the collection. More people should be able to connect with that history, so Coopersmith agreed to share some of his collection here. Early on he saw how easily objects can be lost, and that intensified his collecting. He has the only complete set of slides from a project that documented black life during the Great Migration, the movement of 6 million black Americans out of the South in search of more freedom and safety in other parts of the country beginning in 1916. Forty-four glass slides produced by a Chicago church in the 1920s trace black people from cotton fields and sugar mills in the South to tenements and factories in the North. The set was gathering dust in a Washington, D.C., junk store when Coopersmith bought it for $10. Often he acquires items through an informal network of collectors who keep an eye out for what they know other collectors might want. Most items are found in the South or in large cities in the East or Midwest, but he has also found artifacts in Seattle, including the story of a Quaker who met a slave in upstate New York in the 1790s. He was impressed by the enslaved man’s devotion to Christ and wrote a pamphlet urging fellow Quakers to actively oppose slavery. Coopersmith found the pamphlet in an antique store at Pike Place Market. No one there had read it so they didn’t know how significant it was. Americans are always wrestling with our history because we haven’t understood it or the lessons it teaches. Across the country there have been debates over the meaning of Confederate monuments in public places. It’s difficult to have productive conversations about mass incarceration of black men or the black infant death rate that’s twice that of white Americans at every income level without knowing the history that led to ongoing racial inequalities. The patterns set down in our past still operate. Today black wealth not only lags behind white wealth, but the gap is growing. Black people who get a college education and work hard still earn less and have less accumulated wealth on average than even white high-school graduates. Americans fought segregation in the 1960s and won changes in laws that explicitly restricted black rights. A black person today has a legal right to eat in the same restaurants white people eat in, and yet today if a couple of black men linger in a Starbucks, someone might call the police. The American project isn’t nearly complete.